The Rio Grande Wild and Scenic River encompasses 196 miles of the Rio Grande starting within the eastern half of Big Bend National Park and continuing eastward. It is wild, remote, scenic, and of true wilderness character. In this region of open desert, rugged hills, and deep remote canyons, you can visit natural springs, hike rugged and wild side canyons, and experience class I to IV rapids. This area is unparalleled for those seeking solitude and access to the wide-open Texas sky. The Rio Grande Wild and Scenic River is exactly as its name suggests—a scenic river, a feast for the eyes, and a departure from civilization. Whether you spend one night or many, this remote section of the Rio Grande offers the potential of neither seeing nor hearing other river users and leaving the telltale marks of the modern world behind. You'll find incredible opportunities for birding, wildlife viewing, reflection and soaking in spectacular scenery. The westernmost part of the Rio Grande Wild and Scenic River includes the steep-sided Mariscal Canyon, the actual bend of the Big Bend. This section features a 1,400 foot deep canyon and a class III rapid, the Tight Squeeze. River runners can camp out overnight or enjoy a long day trip with shuttle. The shuttle route on the River Road is part of the adventure and includes stunning exposed geology, an old quicksilver mine, and long distance views of the landscape. 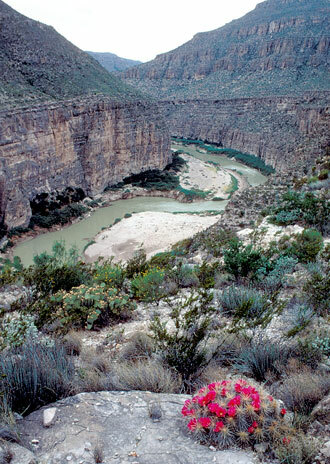 The center of the Rio Grande Wild and Scenic River is Boquillas Canyon. With 1,300-foot canyon walls, this is the longest of the river canyons within Big Bend National Park. 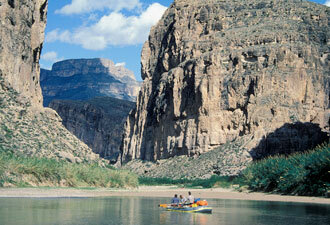 Boquillas Canyon features relatively easy paddling with class I-II rapids and great side canyon hiking. It's a highly recommended trip for beginner skill levels. If the river is running fast and high, plan to spend the night camping; you'll want to gear up for two evenings under the night sky when water levels drop low. 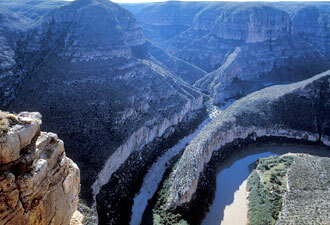 The Lower Canyons of the Rio Grande are east of Big Bend National Park. One of the truly premier river float trips in the lower 48 states, traveling through the Lower Canyons is a five-day minimum trip that can be extended to 10 days or more! The journey begins at Heath Canyon near La Linda and ends at either Dryden Crossing (83 miles) or Foster's Ranch (119 miles) at the end of the designated wild and scenic portion of the Rio Grande. This is by far the least visited and most remote section of the Rio Grande Wild and Scenic River, and a Lower Canyons release form is required. Access to the river is difficult below La Linda, and most of the land above the riverbank is privately owned beyond the Big Bend National Park boundary. The Big Bend visitor center is the best place to begin your visit. Here you can pick up a river use permit and maps that show access areas through the private lands along the river corridor, including some side canyon hikes. Several commercial river outfitters offer guided trips and equipment rentals for the river. Visit us online to find out more about this free-flowing river, the spectacular scenery, and recreational opportunities.